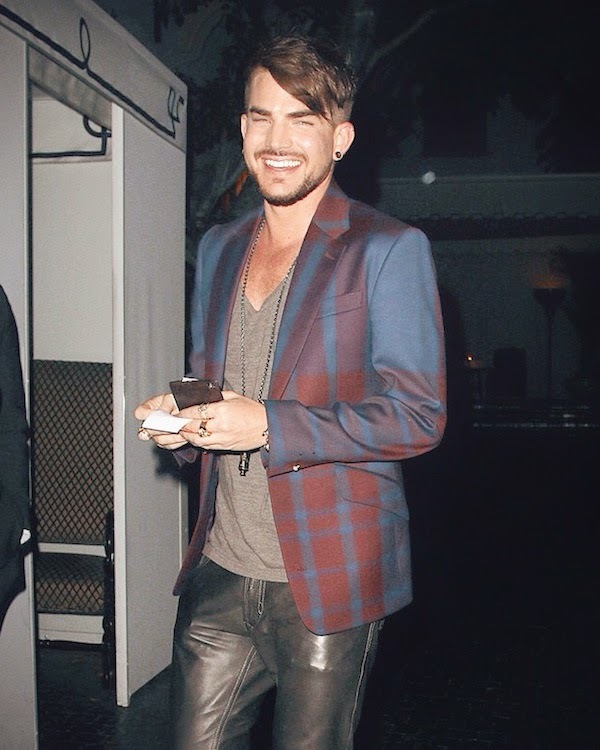 Adam Lambert was pictured at Chateau Marmont on 14th November 2014 in Los Angeles. Adam Lambert wore a maroon and blue checked blazer from Vivienne Westwood Fall Winter 2013. Adam Lambert previously wore the same jacket to the grand opening of Britney Spears's two-year residency "Britney: Piece of Me" at Planet Hollywood Resort and Casino. Back in December 2013, Adam Lambert wore the full suit, including the printed trousers. Same jacket, but totally different styling. I love the pairing of the v-neck grey t-shirt and black leather trousers here. The side fringe, the various chunky rings and statement necklace, really good look. Really loving the basic shades of black and grey, with an eye-catching element of a jacket for this very stylish yet timeless look. Matthew McConaughey wore a similar print suit in London last year. Who wore the look better? How stylish! Yes, love the side fringe! ha! was wondering what to call it. side bangs?? Adam Lambert could make a sack look stylish! Adam Lambert can wear anything and make it look better than any model. He has excellent taste in clothing and footwear.